If you were an investor in Broadway shows and someone came to you proposing a rock musical about a mother with worsening bipolar disorder, that was going to be performed as an operetta (all singing, few spoken sentences), with no show stoppers, no dancing, no chorus numbers, few laughs, and an unnerving ending, written by an author who has never had a big hit, would you invest? Well, a group did, and the result was NEXT TO NORMAL which won three 2009 Tony Awards and the 2010 Pulitzer Prize for Drama and had a smash 733 performance-run on Broadway, and is now touring to sold out audiences. Yes, NEXT TO NORMAL, with book and lyrics by Brian Yorkey and music by Tom Kitt, is a unique musical which addresses loss, death, suicide, drug usage, and the ethics of modern psychiatry, which is getting a mind-blowing production at Lakeland Theatre. The story concerns Diana Goodman, a suburban American housewife, who has a form of bipolar disorder coupled with what might be schizophrenia. The question comes as to whether the condition is hereditary or was induced by a trauma sixteen-years earlier. Together with her husband, Dan, she fights to keep her mind and their family on some sort of “normal” path. Maybe not normal, but next to normal. After extensive therapy Diana decides to stop taking the pills, cuts off all mental health help, including the electroconvulsive therapy, that caused her short-term amnesia. This decision leads to an unsettling conclusion. As both a mental health professional and a theater reviewer, when I saw the original staging on Broadway, and again in its presentation as part of the Key Bank Broadway Series, I was totally caught up in the show. It is like no musical I had ever seen. I left the theatre knowing that I had just experienced greatness. The Lakeland production, under the adept direction of Martin Friedman, with the set and light innovations by Trad Burns, is mesmerizing. Friedman and Burns remove the Broadway three-level set and substitute see-through walls constructed of steel wires, which, like the connections in Diana’s brain, represent her being trapped in a spider web of chaos, causing her to weave in and out of situations which she doesn’t understand and disrupt her direct flow of ideas and movements. In addition, instead of traditional stage lighting, the duo has substituted nearly a hundred lamps of various descriptions to illuminate the set and simulate the on and off flow of ideas in Diana’s mind. The concept is brilliant and takes the script to a level not realized in the original staging. The composite cast is outstanding. Amiee Collier wraps herself in the role of Dianna. She is so real that the character’s pain is Collier’s pain. She sings meanings, not words. She makes us writhe in suffering, her suffering. This is a performance which rivals Clevelander Alice Ripley’s amazing Tony winning Broadway presentation. Rich McGuigan, who, like the rest of the cast, has a strong singing voice, is spot on as Dan, Diana’s husband. We experience his frustration in trying to be an understanding support, but unable to cope with his wife’s obsession with a past trauma, her reluctance to move on, and his inability to deal with the chaos around with any action other than emotional blandness. Hathaway Brown’s Emma Wahl, who appeared on Broadway in CHITTY, CHITTY BANG BANG, captures the very essence of Natalie, the daughter caught between the throes of teenage life and a chaotic home environment. Pat Miller, as Natalie’s boyfriend, Henry, creates a pot-headed, yet supportive safe place for the girl to turn. Ben Donahoo, as Natalie’s brother Gabe, has the difficult task of creating a character of dual dimensions. He does so with clarity and understanding. Tim Allen, as several mental health professionals, is quite believable. Though Jordon Cooper’s orchestra sometimes goes overboard and drowns out the musical speeches of the performers, lyrics that are so important to hear clearly, the musical sounds are well performed and carry the feelings and moods of the story. 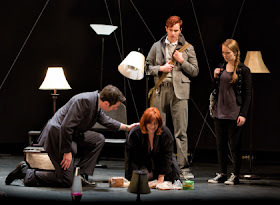 Capsule judgement: Does NEXT TO NORMAL sound like a downer? The script, and the music, and this production are so well conceived, that there is no time during the production that the audience is not compelled to watch with rapt attention. Lakeland’s production is an absolutely, positive, MUST SEE!